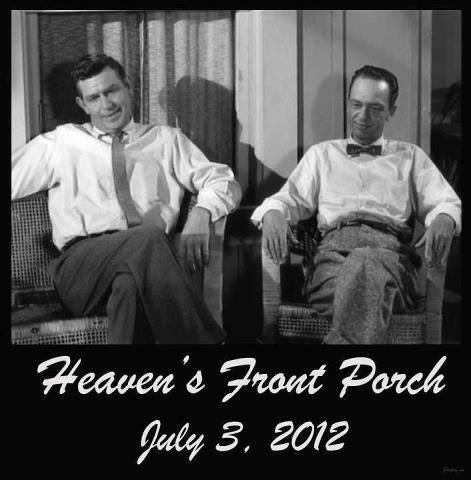 The clip was from an episode entitled “Man in a Hurry.” This man who cannot enjoy life for always being in a hurry begins to find a measure of peace as he hears Andy strum the guitar on the front porch, singing “Church in the Wildwood,” accompanied by Barney’s tenor harmony. The contrast is marked as the man paces back and forth while the restful singing goes forth. As I was choosing the YouTube clip, I also watched one in which Andy plays the guitar and sings “There Is a Time.” That one made me so sad regarding the passage of time that I quickly exited it. Well, today, I posted that one on my wall. Because today, Andy Griffith died. I heard the news about mid-morning as I logged into Facebook and saw a status that read, “R.I.P. Sheriff Taylor.” I gasped and cried out to the hubster, “Oh no! Andy Griffith is dead!” I suddenly began to cry, and the hubster came rushing over to the couch to put his arms around me and comfort me. I was shocked–not only that Andy had passed away, but also that I was so shaken. 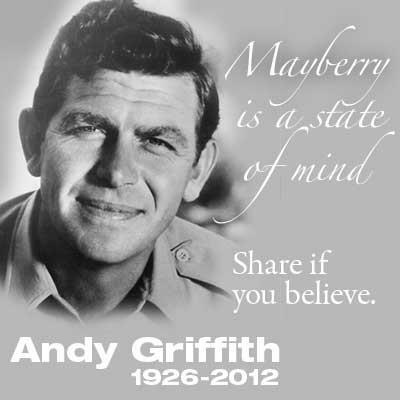 If you had told me last week that I would be sobbing over Andy Griffith’s death, I would’ve looked at you strangely. Become sad? Maybe. Actually shed tears? No way. But when it actually happened, my grief was very real. I went back and watched the clip I posted last week and cried some more. I posted the “There Is a Time” clip, watched it again and cried even harder. A couple of hours later, I posted the song “I Miss Mayberry” by Rascal Flatts with a video tribute to The Andy Griffith Show. And I boohooed a little more. Call me a glutton for punishment, but a few hours after that, I posted a short clip of the episode in which Andy persuades Opie to let his caged birds go free. When the following dialogue took place–Opie: “Cage sure looks awful empty, don’t it, Paw?” Andy: “Yes, Son, it sure does. But don’t the trees seem nice and full?”–I broke down yet again. Now maybe it’s hormones today, but then again, maybe it AIN’T. I’ve seen a similar reaction all over America as news of Andy’s death spread like wildfire. One local TV news channel devoted all day to remembering Andy Griffith. Specials on his life abounded. I saw grown men cry as they were interviewed for news specials. Why did Andy’s death affect us this way? He was 86, he had lived a good life, he seemed ready to go by Christian standards. Why are we unable to let the good Sheriff Taylor go gently into that good night? Because I believe his death signified the ending of an era–an era that represented to us a simpler time of our existence, that reminded us of our childhood, that is rapidly fading into the mists of yesteryear. As long as Sheriff Taylor was alive, Mayberry seemed to still exist somewhere. There was the hope that we could somehow regain even an iota of that peaceful lifestyle. The Mayberry state of mind crosses gender, race, culture. The Andy Griffith Show was all about white people, yet I saw countless black people interviewed today–all of them lamenting Andy’s passing. Women today primarily work outside the home and wear jeans like the men–unlike most of the Mayberry women who stayed home, wore dresses and lived to cook for their families–yet these modern women shed tears today at the loss of Mayberry’s native son. It would be almost unAmerican to say you were unaffected by Andy’s death. Don’t we all recognize the opening theme just as soon as the first bar is whistled? Who hasn’t tried whistling that themselves? Don’t we all laugh when Barney says, “Nip it. Nip it in the bud!”? At one time or another, haven’t we all tried to mimic Goober’s Cary Grant impression of “Judy, Judy, Judy”? It hits us in the collective gut of nostalgia to hear Andy is no more on earth. Who’s gonna make sure Barney keeps that bullet in his shirt pocket? Who’s gonna lock up Otis for public drunkenness and bring him some of Aunt Bee’s good cornbread in the jail cell? Who’s gonna catch Ernest T. Bass when he’s chunking rocks through storefront windows? And for that matter, who’s gonna sit around and pick and grin with the Darlings? The days of my childhood are long gone. No more Sunday afternoons under Grandpa Bray’s shady old oaks while neighbors and relatives drop in to sit in web-design lawn chairs and discuss if the blue mold’s taking the ‘baccer, how many quarts of green beans they’ve put up for the winter, how hot this July weather has been. No more swimming in the creek with the cousins after we’ve wandered through Grandpa’s pastures and picked blackberries. No more catching lightning bugs and putting them in pop bottles on summer evenings while Uncle Sam played “Uncle Pen” or “Let Me Be Your Salty Dog” as my daddy and the other uncles sang along. But there is one thing that remains from my childhood days. The Andy Griffith Show. It was on the air before I was born, and it has never once gone off the air since the last episode was filmed in 1968. I can click on my TV every day at 5:30 p.m. and catch it on a local channel even now. It is one of the last existing ties to my childhood. I have never known a day of life without Sheriff Taylor. Yes, I know The Andy Griffith Show will probably run until I’m long gone. But losing Andy somehow makes the show seem even farther back in time, even more removed from modern life. Lest life seem overly perfect, Mayberry had its thorny issues. Aunt Bee faced pickling problems and was ever challenged by her bosom buddy Clara Edwards. Opie sometimes told fibs and had to confess to “Paw.” Barney often sneaked off to call Juanita down at the diner and serenade her while poor Thelma Lou was at home alone. Ernest T. Bass turned up with his violent ways at all the wrong times. And Otis just kept a-drinkin’. But still, Mayberry life seems ideal to us today in our rush-rush-hurry-hurry work-a-day world. There was a sense of community that we are lacking. Neighbors took time to sit on the porch and visit. Floyd’s Barber Shop was a hangout for the men. The Pyle boys–Gomer and Goober–were ever-present when a helping hand was needed. Andy’s job of sheriff kept him on call around the clock. But he somehow found time to spread a quilt on the green grass to picnic with his best gal, Helen Crump. He took Opie down to the fishing hole and maybe whistled while he went. He made time to play his music with the Darlings, complete with a gen-u-INE jug instrument. Yes. Yes, it is. But Mayberry is more than a made-up town. It’s a state of mind, I’ve heard people say. And it’s most certainly MY state of mind. THAT’S why we cry over Andy’s passing. Because many of us still long for the Mayberry state of mind where life flows peacefully and seems to move in slow motion compared to the jet-fast pace of modernity. A place where Ange is patiently advising the Barneys among us, licking his lips saying “Mmm, Mmm!” over Aunt Bee’s pork chops, calmly counseling a penitent Opie, singing and playing for us at the end of a hectic day. The faster we move through life, the more we yearn for the old paths of life. Andy was representative of that rustic, slow-paced way of living. And now he’s gone. Nope, we’re not just mourning the passing of Andy. We’re mourning the passage of an era that will never come again. Thank God that way of life, as well as Andy, will live on through reruns of his show. We’ll continue to tune in and reminisce and laugh and wish it could be that simple again.